The information on this website is provided in compliance with the federal Jeanne Clery Disclosure of Campus Security Policy and Campus Crime Statistics Act. Additional information about the University's security policies and procedures and crime statistics for the three most recent calendar years can be found on the Widener University website. 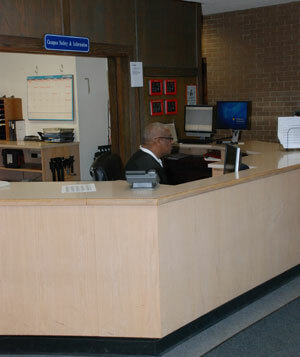 Located in the lobby of the Concord Residence Hall, the Campus Safety Department provides 24 hours a day, 7 days a week service and protection. The telephone number for emergency calls is x 2200 while on campus and 302-477-2200 from an off campus phone line. The department utilizes foot, bicycle, and vehicular patrol to ensure highly visible coverage of the campus. The Campus Safety Department enjoys an excellent working relationship with the Delaware State Police, which has primary police jurisdiction for the Delaware Campus. All matters brought to the Campus Safety Department's attention are investigated to determine appropriate action. The Campus Safety Department will assist any member of the university community with contacting local law enforcement. The Campus Safety Department also encourages victims of crimes to report these incidents to the police department within that jurisdiction. Safety personnel are identified under the Delaware Code as proprietary agents of the university whose authority is limited to the immediate and adjacent vicinity of university property. Campus Safety officers do not carry weapons. Widener safety officers in Delaware do not have the power to arrest. In addition to the Director and Chief, 15 full-time officers, including on-duty shift supervisors, comprise the authorized force. Under the supervision of the Chief of Campus Safety, officers are provided in-house training in basic criminal laws and procedures. Additionally, all receive on-the-job and in-service training and instruction in first aid, cardiopulmonary resuscitation (CPR), and automated external defibrillation (AED).